There are few things as awe-inspiring as watching water rush down a mighty waterfall while you’re enveloped in fall foliage. 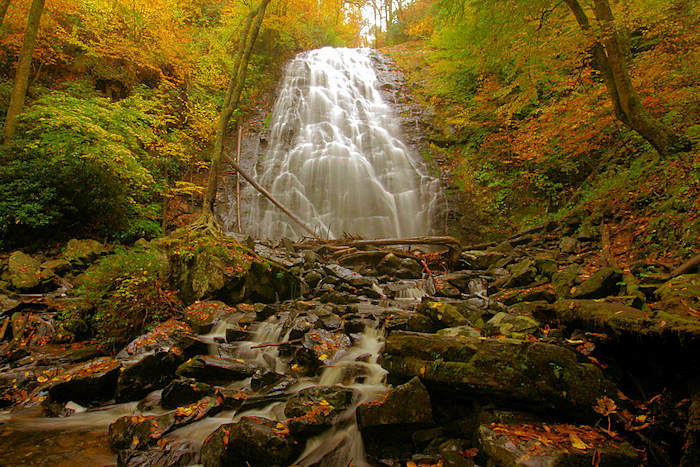 That’s what makes Crabtree Falls one of our favorite hikes for reveling in WNC’s stunning fall colors. This rewarding hike sits on the border of the Black Mountain range and the Blue Ridge Mountains and offers a couple of options: a 3 mile out-and-back or a 3.5 mile loop. After following the Crabtree Falls Trailhead to the falls, you can choose to return on the same path or climb the stairs that cross Big Crabtree Creek and follow the loop path along the creek for a 1.7 mile hike back to the parking area. While the loop path is a bit more challenging, we think it’s definitely worth the effort. Be careful while hiking and exercise extra caution around water; keep an eye out for slippery surfaces and wear proper footwear. Always follow our Outdoor Safety Basics.